Discussion in 'DIY Speakers and Subwoofers' started by Matt Grant, Feb 10, 2014. Does that mean kits will be made available through DIYSG? We discussed adding them but it hasn't moved forward beyond that. In the mean time I have added the new crossover info for all the designs as well as the cabinet info. I still have to gather measurements and add those but all the info needed to build the updated designs should now be available. 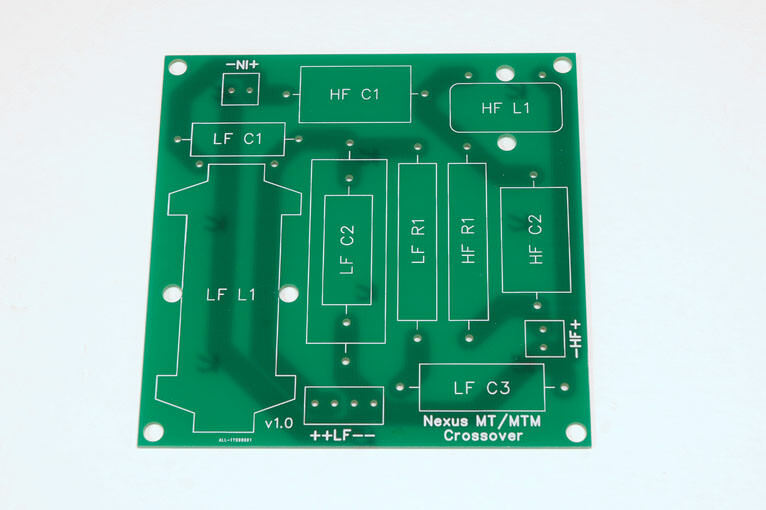 I also have PCB's designed for these (one for the TM/MTM design and another for the Center/tower designs) which I can likely get a small number of them made up. If anyone is interested in those let me know. Do you put some damping material inside the medium chamber? Also, where i live we have the metric system... and 3/4" would be 19mm... but the wood i can buy would be only 18mm thick (0.7")... Do you think i have to change the cutting dimensions or it's just the same thickness and i'm being paranoid? Can i screw (in addition of the glue) the wood together or is it a bad idea? The midrange chamber is meant to be filled with some kind of damping material leaving just enough room for the drivers. I used recycled denim insulation but fiberglass, polyfill or acoustic foam will work fine as well. The woofer section of the cabinet should have damping material lining the walls, but I also have the top portion of that cabinet behind the midrange chamber lightly filled. Make sure to leave the area around the internal port flare empty as not to restrict airflow through the port. Using plywood is fine as are 18mm thick panels. The external dimensions do not need to change neither do the internal dimensions of the midrange chamber, 3" deep x 14.75" high, though it could be rounded to 75mm deep x 377mm high if that's easier. In fact the cabinet could be made 250mm wide x 1170mm high x 380mm deep to round things out (height where back angle begins would be 775mm high, top changed to 250mm back). Base plate can be 300mm wide x 430mm deep. Mine was made from a layer of 1/2 and 3/4" MDF sandwiched together with a 1/2" chamfer added. If you have 12mm and 18mm that works too. But feel free to change it up if you like, it's just there to widen the feet and add stability. Port center would be 155mm up from the bottom and it can be placed on the front if desired. Screws are ok to use during assembly of the cabinet. I haven't heard the 683's. The only B&W's I have experience with are the Matrix 804's and I much prefer these to the 804's. The highs were nice on those but the midrange sounded too laid back almost suppressed. The bass on the Nexus feels more impactful and in controlled while I felt it was on the muddy/boomy side with the 804's especially when they were turned up. 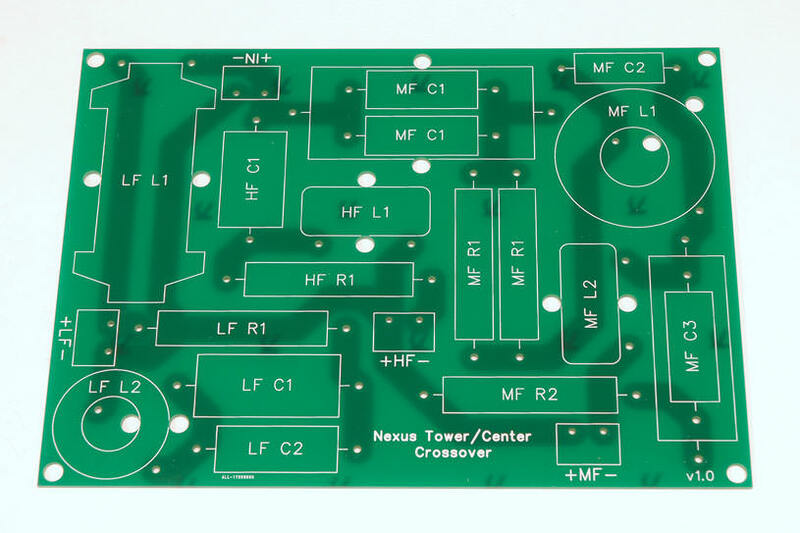 I ended up getting a few PCB's made for the new crossovers, if anyone is interested in those let me know. They are designed so the you can use either Poly or NPE caps on the midrange. The woofer on the Center/Tower board only supports NPE but I don't really recommend poly capacitors on that as they get to be pretty big/expensive when you get to that size and you won't notice a difference for just bass anyway. Matt. ive been thinking about these MTMWW sepakers for a long long time. now that ive decided to order the items. ive found that there is no sd215 in stock until august in Parts express. im from argentina. so i should buy everything in one place if possible. is there any other speaker that i could use without modding ? or any other place to buy? Hi Gaston, It looks like Parts Express will have the SD215 in stock on May 8th, not August 5th. If you can wait a month I'd use those drivers as I haven't tested another woofer that would be a suitable drop in replacement. Opps. it was just a translation mistake. down here we write Day, Month and Year. i forgot you use MONTH day and year. Thanks for the reply. ill wait and come back when i get the items. Are There any boards left? I'm interested in 3 tower/center and 2 tm/mtm boards. Just got my tower crossovers done. What is the port length for the TM? Port for the TM is left full length when using the 1-5/8" flared port 260-474 from parts express. Also for future reference I noticed a had made a mistake on the instructions I gave to NDJ for the MTMWW crossover, the placement of the 12uF and 0.68uF capacitors in the above photo should be reversed. The description says: uses two of the Dayton SD215A-88 subwoofer drivers in series as the low end. Am I reading the schematic wrong, but that looks parallel? Sorry it's a bit confusing I'll need to clarify the post. The SD215A-88 are dual voice coil woofers so the voice coils should be wired in series and the two drivers then wired in parallel to the crossover output. Technically you could also wire the voice coils in parallel and wire the woofers in series for the same result. In the crossover for the center, the 0.51 ohm resistor is for R1? It's listed as R1 on the schematic but on the PCB it is placed in the LF R1 spot. Technically the latest crossover has only been tested on the WTMW center configuration. The same crossover should work for a vertical WTMW or TMWW design but the frequency response will be impacted slightly by the baffle diffraction effects from different driver placement. The WTMW design should be closer to the horizontal center channel design in that regard. I would like to build some speaker this winter. My old SVS SBS-02 with their 82 db efficiency just don’t cut it anymore. Since this will be a living room setup realistically the best setup for me would be some tower speaker with ~8 inch woofer. I was hesitating between Cobalt-8, Fusion-8 and Nexus tower. I know they all have different characteristics but now I’m leaning toward the Nexus Tower because they are cheaper, easier to ship to Canada. I also listen to around 40% music, 40% tv and 20% movie. I use my home theater sometime 4 to 12 hour a day (weekend) because I play a lot of music while I do stuff around the house. Dome tweeter would most likely be less harsh on the ears for long usage like I do versus waveguide. All these reason make the Nexus quite interesting for me but I have a few question. First of all I would consider MTMWW Tower for LR with a regular center channel. For surround I would go with MT or MTM built as a faux wood beam angled brace (WAF). My question is how bad would it be for bsc to build then 8 to 9 inch wide instead of 7 inch? My beam will be around that width and the brace as to match ideally. 2nd question would be if the part list on the first page are still up to date? These speaker appear to be really cheap (round 170$ each tower) or I’m mistaken? 3rd question is, Do you still have crossover board available? And finally, I know it’s probably inappropriate but how would these compare to the Polk Audio RTI a9 speaker? I would most likely order these around Black Friday to save some money (parts-express coupon) and at the same date the Polk speaker usually are discounted for 300-400$ CAD each wich is equal to 2-300$ USD. I really want to build my own speaker because I enjoy it but I also want them to be better than commercial offering in the same price range. Making the TM or MTM wider will affect the baffle step region, which means the response won't be a flat as in the cabinet it was designed for but as a surround speaker it shouldn't be a big issue. The Parts list on the first page is current, they are not terribly expensive to build for what you get which was a goal when I was designing them. I can't really say how they compare to the Polk RTI a9, I don't have any experience with those speakers but I would not be afraid to put them head to head. I do still have the Crossover PCBs available for these designs. I will be cutting the parts for my Nexus MT this weekend. Is it possible to put the port on the front? (below the woofer, centered) I will probably need to make the cabinet higher and shallower to keep the internal volume the same. Or leaving the port on the back won't be a problem? If they are 5-7" away from the wall you can leave the port on the back of the cabinet, it's not a problem until they are closer to the wall then the diameter of the port. But you wanted to you can put the port on the front below the woofer. I’m about to order these today or tomorrow with Black Friday coupon code. I was wondering if it’s possible to build the TM as a sealed enclosure to obtain a smaller enclosure for rear surround and atmos use? Would it be able to use a 80hz hpf for HT use? Because I would most likely skip on the port for these if it work. You can build the TM design sealed in a small 0.08-0.1cuft enclosure. However the woofer will rolloff around 100hz when used sealed. You could certainly use it with an 80hz highpass without worrying about damage to the woofer but the response at 80hz will dip down a little bit (~3dB) because of the higher natural rolloff point. That said when for surrounds I'm not sure how noticeable that little dip in output at 80hz would be.